Saunders College of Business ranked eighth in the “Top 25 Online MBA Programs for 2018.” Saunders College online Executive MBA program also earned high placements the past three years since the inception of The Princeton Review’s comprehensive rankings of online MBA programs in 2015. Saunders College online Executive MBA program also earned high placements the past three years since the inception of The Princeton Review’s comprehensive rankings of online MBA programs in 2015. The result of The Princeton Review’s third annual ranking of the top 25 online MBA programs for 2018 is available at www.princetonreview.com/best-business-schools along with FAQs about the basis for each ranking, including detailed profiles of the schools. “As more students embrace online MBA options, the caliber of both students and programs has greatly improved, so it is especially gratifying to see recognition at the national level of our students’ commitment to their own professional development, as well as evidence of our faculty’s high-touch engagement with their students,” said Martin Lawlor, director of the Executive MBA program at Saunders College. According to one Saunders online Executive MBA student, “This is an intense program that prepares students with unimaginable leadership capabilities,” while another mentioned, “innovation, product management, marketing and analytical” skills as part of the program’s strengths. Saunders’ online Executive MBA program was cited by students for its “well-known, rigorous and accelerated program” that delivers 47 credit hours in 17 months of study, an international immersion trip that is “a huge benefit to attending RIT,” and “real-life courses and assignments” culminating in a capstone project where students serve as consultants to actual businesses. “A whopping 50 percent” of graduates reported receiving a promotion while attending the program. 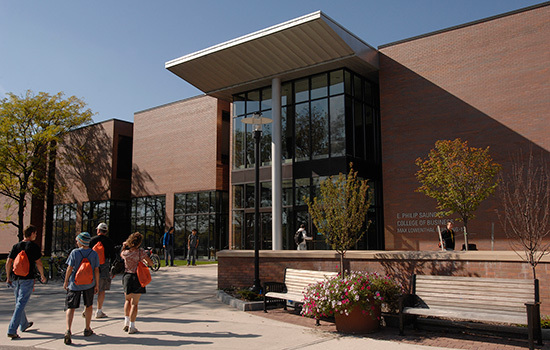 Saunders College is accredited by the AACSB (Association to Advance Collegiate Schools of Business) and offers the Executive MBA program with flexible scheduling options and access to a dedicated MBA career services advisor, as well as free lifetime access to RIT’s Career Services.